Ottawa, 28 October 2014. Parliament of Canada. Irwin Cotler, receives from Mordechai Paldiel the Raoul Wallenberg Centennial Medal. 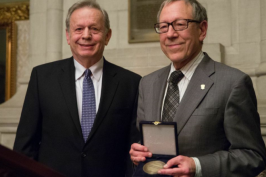 On the occasion of the 60th anniversary of Raoul Wallenberg’s disappearance, on the eve of the 60th anniversary of the United Nations Charter and the Nuremberg Principles, Irwin Cotler insisted on some truths that are unfortunately disturbing today. To conclude, Cotler challenges us: “This Raoul Wallenberg commemorative day and the conference invite us to learn about, reflect upon, and be inspired by the unparalleled and unprecedented heroism of this great humanitarian who, in his singular protection of civilians in armed conflict, signified the best of international humanitarian law; who, in his singular organization of humanitarian relief, exemplified the best of humanitarian intervention. This then must be our task: to speak on behalf of those who cannot be heard; to bear witness on behalf of those who cannot testify; to act on behalf of those who put not only their livelihood, but their lives-on the line. We need, simply put, to live human rights to become the implementers of international human rights law. That is what the protection of human security is all about”.